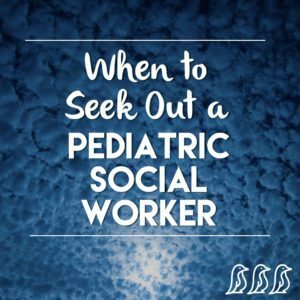 What is a pediatric social worker, and how can they help? I recently had the opportunity to speak with Liz Disterhoft & ask her a whole bunch of questions about the field of social work. Liz has been working as a social worker in community health for eight years. She is currently a social worker at a unique pediatric practice that utilizes a team-based approach to care. This experience made her the perfect person to talk to about concerns that many parents have regarding their children & social work services. The main thing that sets licensed social workers apart from other professionals in similar areas is our unique perspective. We put a focus on sociology into our clinical work – how culture fits into a client’s life – how family systems affect lives – how community integration impacts the client’s life. Once we identify struggles, we work with the client to either provide therapeutic interventions and/or connect them to resources that will have a positive impact on their well-being. I see parents of newborns all the way up to 20 year old “kids.” I help people cope with a variety of situations – trauma (car accident, death in the family, domestic violence, divorce), developmental delays (speech & language concerns), mental health concerns (anxiety, depression, & others), identity issues (gender identity & cultural identity), chronic medical illnesses, social issues (bullying, social skills, self-esteem, etc), family placements (foster care & adoption), & more. I work closely with children & families to give them the tools & resources to improve their current struggles. My job is to make their lives easier, not more complicated, so we work together to find solutions that will make sense for the individual. Creating that therapeutic alliance is so important. When working with children, the social worker’s relationship with the parents are just as important as the relationship with the child. Everyone needs to be on the same page with how therapy can positively affect the family. Q: You often see pregnant & postpartum mothers – what can you tell me about that? Many people hesitate to reach out before they hit a crisis point; however, social work can enhance life at any stage. It is much easier to improve your own life & your child’s life if you reach out sooner rather than later. Many people fear that they will be labeled as “crazy,” & they don’t want anyone to find out that they might need some support. The reality is that we all need extra support from time to time, & reaching out to a professional is actually a very healthy & intelligent thing to do. Another common hesitation is the fear of the unknown. I am able to calm those fears by assuring clients that it is a social worker’s job to meet the client where they are at. The client drives treatment, & we work within that comfort zone. All of this depends on the child & their family. The goal is to have the client be self-sufficient & responsible for their own healing process, & we are here to help in any way we can. We won’t be offended if you ever need or want more or less treatment! There is another time to reach out that people often do not consider – the toddler years. Of course, I am not working solely with a two year old; I get to work with the family & give them recommendations on things that they can try to get through this difficult stage of life. I specialize in child development & am able to give a unique perspective as to what’s going on, what is normal, & yet how to improve daily family life. As mentioned above, there doesn’t have to be a crisis to seek out support. Sometimes people don’t get help early on, & they have already been through so much before reaching out for help. Don’t hesitate to reach out! Social workers are the friendliest people you’ll ever meet ??? ?